A man has been charged with terrorism offences after so-called Islamic State (IS) propaganda magazines were allegedly found on his computer. 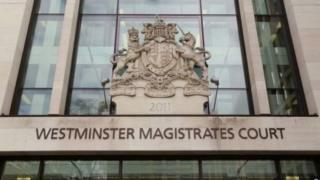 Atiq Ahmed, 34, from Oldham, Greater Manchester, appeared before Westminster Magistrates' Court earlier where he denied all charges. The court heard police officers allegedly found five issues of Rumiyah magazine on his laptop. He was remanded in custody to appear at the Old Bailey on 19 January. Mr Ahmed, of Copster Hill Road, is charged with five counts of possessing documents likely to be useful to someone planning or committing an act of terrorism. The e-zine is written by the IS propaganda wing and disseminated online to try to attract new recruits. Police said a warrant was executed at an address in Copster Hill Road, Oldham, on Tuesday.